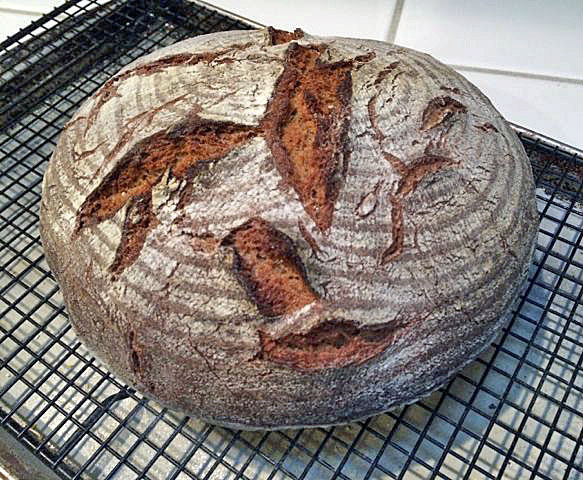 Yesterday, I baked a bread based on Ken Forkish's "Pain de Campagne" from Flour Water Salt Yeast. Forkish's is basically a white bread. Mine is made with 500g AP, 200g WW and 100g Rye in the final dough. 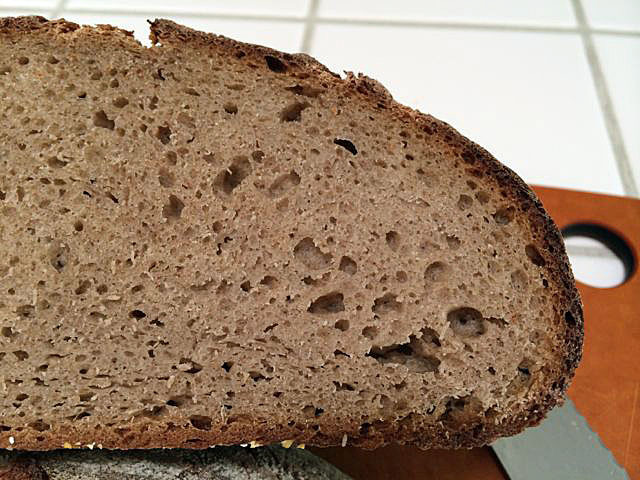 (The levain contains 160g AP and 40g WW flours.) I also omit the instant yeast. We really like this bread. 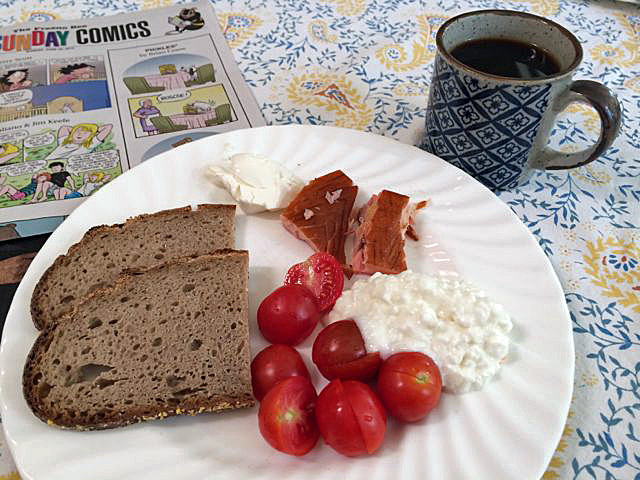 Today, I made a German-style rye bread. 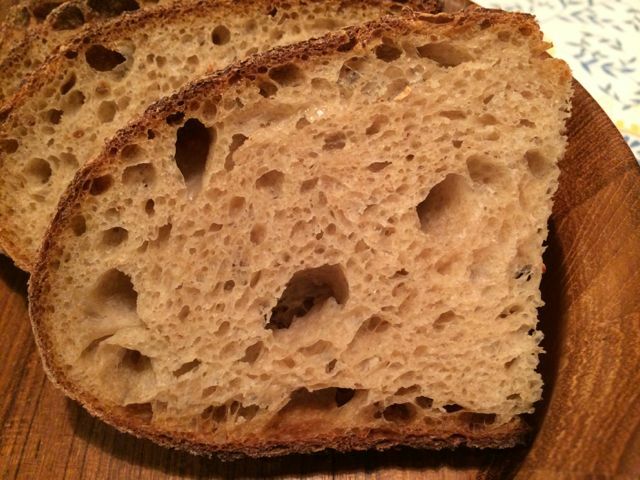 This 70% rye was inspired by Hansjoakim’s “Favorite 70% Rye.” It is basically the same as his formula which I first baked in September, 2009. The baking protocol has been modified slightly and gives a better result, I think. Note: 35% of the total flour is from the rye sour. The day before baking, mix the final rye sour build. This should ferment at room temperature for 14-16 hours. Mix all the ingredients in the final dough in a large bowl. If using a stand mixer, mix for 3 minutes with the paddle at Speed 1. Switch to the dough hook and mix for 2-3 minutes more at Speed 2. The dough at this point is a thick paste with little strength (gluten development providing extensibility and elasticity). Optionally, after mixing, you can knead briefly on a floured board with well-floured hands. Transfer the dough to an oiled bowl, cover it tightly, and ferment for 1 hour. Transfer the dough to a floured board and pre-shape it into a single round. 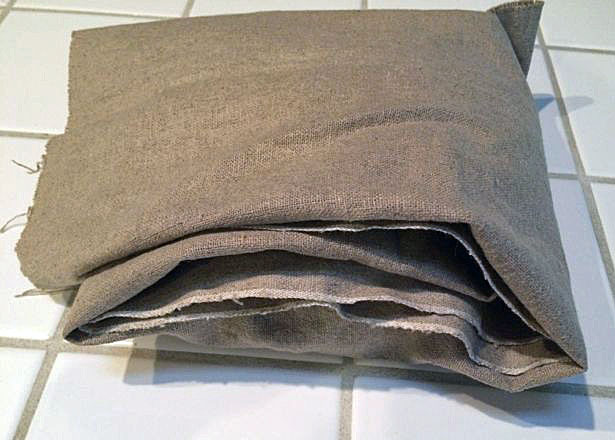 Cover with plasti-crap or a damp kitchen towel and rest for 5 minutes. Shape the dough into a boule and transfer to a well-floured brotform or banneton. If you want the rustic look of this bake, place the boule seam-side down in the brotform, so, when you flip it on to the baking stone, the seam-side will be up and will open with oven spring. If you want a less rustic look, place the boule in the brotform seam-side up. Then, just before baking, flip it onto a peel and dock the loaf. One hour before baking, pre-heat the oven to 250dC/480dF with a baking stone and your steaming method of choice in place. When ready to bake the bread, turn the oven down to 460 dF. Then transfer the boule to a peel. Score or dock it. if you proofed seam-side up. Otherwise, don’t. Transfer the boule to the baking stone. Steam the oven. After 10 minutes, remove your source of steam from the oven. After 15 minutes, turn the oven down to 225C/440dF. Bake another 20 minutes, then turn the oven down to 205dC/400dF and bake yet another 20 minutes. The loaf is done when the crust feels firm, it gives a “hollow sound” when the bottom is thumped and the internal temperature is 205F or greater. When the loaf is done, turn off the oven, but leave the loaf in it with the door ajar for an additional 10 minutes. Transfer the loaf to a cooling rack and cool thoroughly. Leave it 24 to 36 hours, loosely wrapped in linen, before slicing. This loaf is now cooled and wrapped in bakers linen. It was "cured" for 36 hours before slicing and eating. P.S. If a medieval German knight had a very good baker, he might be lucky enough to have a bread like this on his table. Both look excellent David. So with the seam down method there is no need for docking? One less step not to forget and beautiful taboot. Just enough PDC to eat while you wait on the Rye to cure. I wish I could beam ya some of the kraut I recently finished for your upcoming Reuben. 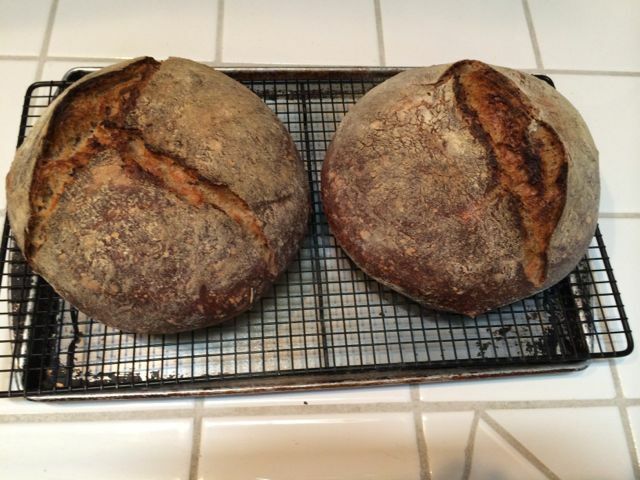 Both the PdeC and the rye were proofed seam-side down and baked without scoring or docking. The biggest problem I have had with this technique is forgetting I'm using it and sealing the seams too well during final shaping. Otherwise, it makes for a great, rustic effect. I love good sauerkraut but my wife doesn't, and we eat almost no red meat these days. I can just see myself at 120 years old, sitting there thinking about all the corned beef I didn't eat and drooling. I'm actually off to get some smoked salmon and cream cheese, which is my favorite (permissible) topping for this kind of rye. You've made/eaten I'm sure you'll have no regrets on the food front. I'm sure the cream cheese and lox will do the trick. This is exactly what that loaf on the breakfast buffet should have been! I'll include your bread in my challenge summary blog post. I had the rye in process when I read your post. It was fate! Anyone, including a knight, would be lucky to partake in such lovely breads. Beautiful bread all the way around. That rye would have been perfect on a knight's table in 1529. The rye and wheat version of the Pain de Campagne is also a nice twist with that crumb being so open with so much whole grain too! I love your idea to cure in linen, I recently baked a 2.5kg loaf and failed to think of wrapping, my cure was open air....next time i'll think of you and your linen. I'm drooling over your 70% rye, looks perfect. I bet that it was packing a splendid aroma. From my reading, the rest wrapped in linen routine is traditional. It does improve the bread. The only bread that is more aromatic baking than a 70% rye is a bread with even more rye.